This is the #1 selling English Book prepared by a native English speaking author, for sale in China. It's so successful in China, that we are now rolling it out outside China! It's a fantastic book for all non-native English speakers, to help you improve their English. Here we GROW again! We believe this is our best book yet! Indeed, This is an exceptional book for beginners to low intermediate learners of English because of its simple, easy to read format and abundance of applied learning material. And, check this out: we guarantee this book to be free from errors, misinformation and Chinglish or we’ll give you a refund. What publisher or book-store will do that?! 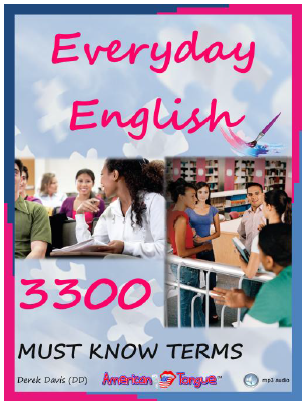 “Everyday English: 3300 MUST KNOW TERMS” was written and designed for beginner to low intermediate learners of English (A1-B1). It consists of 372 pages and approximately 72,000 words. There are no images to make the book look bigger like the domestic books. Also, there is no translation, which would increase the size of the book while limiting learning material. If you want translated words, buy a dictionary and memorize it! The book contains useful, complete sentences, not partial sentences like some domestic books. How can you learn if there is no context in the material? Likewise, it does not contain long news articles or stories that fill-up the book. Want stories? Buy a novel! Additional terms have been added to supplement the learning process and expand student’s vocabulary much more quickly by using practical learning methods underscored by English as a Second Language research principles - seeing it written, hearing it spoken, writing it so it can be applied, and speaking - “Everyday English: 3300 MUST KNOW TERMS” is NOT a learning by rote textbook! Best of all, it is written in authentic English using an English thinking ideology, not a foreign language perspective. The professionally produced mp3 audio is presented by Derek Davis (DD), a native English speaking, 30 year voice actor and recipient of the U.S. Department of Treasury’s Special Award for ingenuity. The audio is spoken at an average, normal speed so students can ascertain the prosody. It uses a narrative format and includes helpful tips on using the terms in real-life situations. The high-quality, studio produced audio focuses primarily on clear enunciation and prosody (how words blend together, intonation, pitch, voice inflection, speed, etc.). Prosody matters for intelligibility. There are 23 mp3s, each representing a lesson. The average time of each lesson (mp3) is approximately 15 minutes. File sizes vary in MBs. Total zip file is approximately 250MBs. If you can find a better book, buy it! This book is perfect for CET4/6, TOEFL/IELTS, SSAT, TEM or other essential exams that require vocabulary and listening skills OR for the serious learner eager to accumulate a solid vocabulary and improve listening, pronunciation (enunciation) and spoken English more quickly. Remember, it’s not how many words you can memorize (passive vocabulary); it’s how many words you can use well (active vocabulary) in Everyday English. This book is your first step to becoming an effective, efficient user of English.